I hope everyone had a very happy holiday! We had a great one at Tim’s brother’s house. Charlotte loved being with her cousins Kaylin and Sidney. And, we all ate very well! They share my love of the Barefoot Contessa and she featured heavily in our holiday meals. For Christmas, Doug and Julina gave me Molto Batali: Simple Family Meals by Mario Batali. I have loved Mario Batali since my first visit to Po about ten years ago. My love of his cooking has only grown as I have visited Babbo, Lupa, Del Posto, B&B Ristorante (in Las Vegas), and Casa Mono. Despite dining at many of his restaurants, I did not own a Mario Batali cookbook until now. The book is organized by month which I love since I try to cook seasonally. Each month features three primi (pastas), one secondi (a meat main course), and four contorni (veggie sides). I turned to the December chapter for my first recipe from the book. 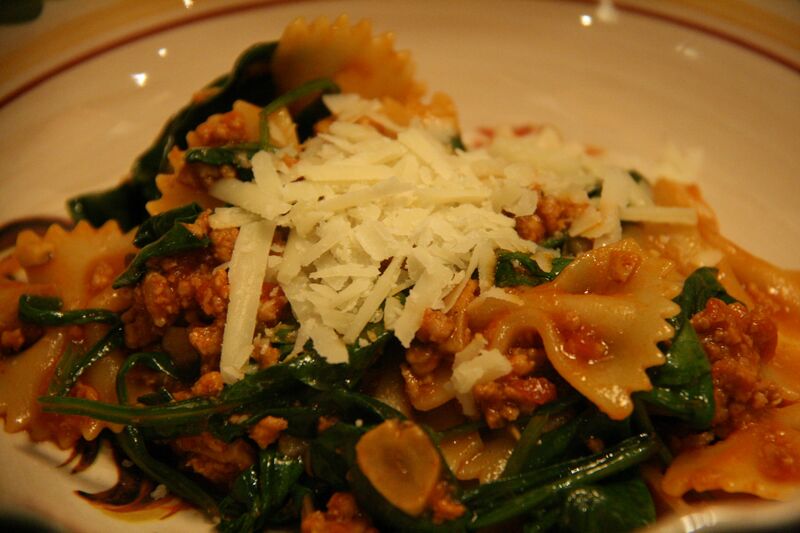 The photograph of the Farfalle Abruzzese with Veal, Porcini, and Spinach called to me! The recipe was out of this world and tasted as if the sauce had been simmering for hours! I think the porcinis and the liquid from re-hydrating them added some very rich, earthy flavor to the dish. I actually was a little light on the porcinis and spinach. I only bought 2 ounces of the mushrooms and 5 ounces of baby spinach. I am sure the dish would be even more flavorful with the full quantity of each. Be sure to top the pasta with freshly grated pecorino. It’s a great complement to the dish! It can serve 6 as a main and is perfect for entertaining. I will certainly be making this dish again. Drain the porcini, reserving the soaking liquid, and coarsely chop the porcini. Strain the soaking liquid through a fine mesh sieve, and set it aside. In a large skillet, heat the olive oil over medium-high heat. Add the garlic and cook until it is lightly toasted. Add the veal and the chopped porcini, and cook, stirring, over medium-high heat until the meat is well browned, about 10 minutes. Season with salt and pepper to taste, and add the tomato paste. Cook over high heat, stirring constantly, until the paste turns a rust color, 5 minutes. Then add the wine and 1 cup of the strained porcini soaking liquid, and cook for 5 minutes, until the wine has almost completely evaporated. Add the tomato sauce and reduce the heat to a very low simmer. Bring 8 quarts of water to a boil in a large spaghetti pot, and add 2 tablespoons salt. Drop the farfalle into the water and cook for 1 minute less than the package instructions indicate. Just before the pasta is done, carefully ladle ¼ cup of the cooking water into the veal mixture. Stir the baby spinach into the veal mixture. Drain the pasta in a colander, and add it to the veal mixture. Toss over medium heat for about 30 seconds, until the pasta is nicely coated. Pour into a warmed serving bowl and serve immediately, with the grated pecorino on the side. I love Giada! Much like the Barefoot Contessa, her recipes have never steered me wrong. Italian food is what I love most and Italy is my favorite country to visit. Giada, born in Rome, has made delicious Italian home cooking accessible to everyone. Her recipes are always incredibly flavorful but never overly complicated or fussy. Plus, she genuinely seems like someone I would want to be friends with. I am a little jealous of her amazing figure and what I can only imagine as her very well-appointed closet and home (her husband is the Creative Director for Anthropologie). The other weekend Tim and I had a delicious meal courtesy of Giada. Even though I don’t make it very often, we both love veal. When I was at my gourmet market in the Berkshires, they had some beautiful veal cutlets so I decided to make veal marsala. Her recipe is simple and delicious. If you like veal and mushrooms, this really cannot be beat! For a side dish I made her Peas and Proscuitto. So quick, easy and flavorful! The sweet peas and the salty proscuitto are a great combination! I bet even my mom who hates peas would enjoy it! This side dish is going to become a staple.